Oscar Cancino was appointed interim executive director of the Agua Special Utility District. During an investigation into payments made to two former employees, the executive director of the Agua Special Utility District, who was tasked with negotiating those payouts, distanced himself from them, believing them to be “exuberant,” according to a summary of his interview with investigators. Last month, the Hidalgo County Criminal District Attorney’s office closed the investigation into those payments to the two former Agua SUD employees, citing insufficient evidence to charge anyone with a crime. The payments were made to Oscar “Coach” Salinas and Armin Garza, who were employed with Agua SUD as community outreach coordinator and utility project manager, respectively. Salinas and Garza serve on the La Joya school board of trustees, which also employs the majority of the Agua SUD board of directors. That relationship between the Agua SUD board and members of the La Joya school board was viewed as potentially fostering conflicts of interest by state Sen. Juan “Chuy” Hinojosa, who introduced Senate Bill 814 to prevent Agua SUD from hiring school board trustees. The bill essentially outlawed Salinas’ and Garza’s employment there. However, as SB 814 was still making its way through the state legislature, Agua SUD executed five-year contracts with both men. Those contracts were believed to have been in direct response to the bill, former Executive Director Oscar Cancino told Texas Ranger Reid Rackley during a Jan. 18 interview, according to a summary of that interview. Cancino did not immediately return requests for comment for this story. Cancino, the executive director from October 2016 to September 2017, said not even he had an employment contract with Agua SUD and was not involved in drafting the contracts for Salinas and Garza. Throughout the interview, Cancino discussed how the two men were treated differently from other employees. For instance, he was told by the majority of the Agua SUD board that Salinas reported directly to them and not to him, according to the interview summary. The executive director also said Agua SUD Board President Roger Hernandez directed him to give Salinas and Garza a vehicle stipend and later raise their annual salaries to $70,000 and $85,000 respectively. Hernandez also did not return calls and text messages requesting comment. 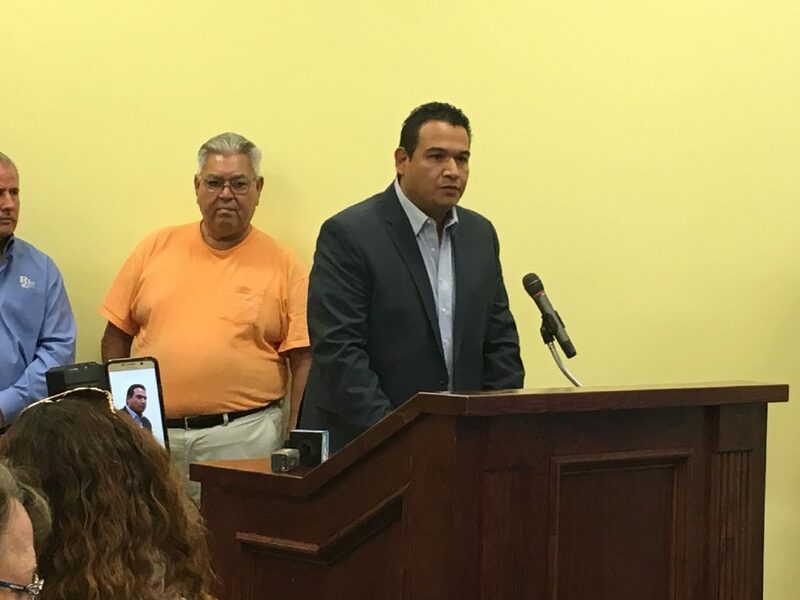 “Cancino said that his salary at Agua SUD was $100,000 annually as the executive director and he did not have a vehicle stipend,” Rackley stated. The contracts Agua SUD eventually forged with Salinas and Garza led to payouts of $221,000 and $268,000, respectively, when SB 814 was passed. Cancino told Rackley he thought the five-year contracts were a little extreme but, despite his reservations, signed off on them. He said he was told by Javier Peña, an attorney contracted by Agua SUD who helped draft the contracts, that it would be less costly to settle with the two employees than to fight them in court. Cancino’s account of this is corroborated by a summary of an interview of Peña included in the same report. Peña, when reached by phone on Monday, said there were a few inaccuracies in the summary of his interview with Ranger Rackley and insinuated the summary of Cancino’s interview, whether accurately detailed by the Texas Rangers or not, was filled with falsehoods. The attorney added “there are many communications” that disprove what Cancino reported to the Rangers. Peña also pointed out a meeting he had with Hinojosa, mentioned in the Ranger’s report, in which Peña alleges Hinojosa suggested keeping Salinas and Garza employed with Agua SUD, but through a staffing company. “I never suggested anything about the two school board members,” the state senator said late Monday, clarifying that he was speaking of other Agua SUD employees who might be affected by the law. The law applies to relatives, to the third degree of consanguinity, of La Joya school board members as well. Other noteworthy allegations in the interview include Cancino’s suggestion that there was a quid pro quo relationship between the Agua SUD board and the La Joya school board. “Cancino said that the Agua SUD board members through these proceedings, were getting pushed up and given pay raises and higher positions as employees at La Joya Independent School District,” the report stated, which is what Hinojosa has stated SB 814 was meant to prevent.